Steel cut oats are whole grain groats, or the inner portion of the oat kernel, which have been cut into 2 or 3 pieces. In contrast to rolled oats, the most common type of oat, steel cut oats have not been rolled so they look like small rice grains. Because of this it takes longer to digest and has a more sustained release of energy into the bloodstream, an important factor for runners. The slower digestion also keeps you feeling full for a longer period of time. Rolled oats, on the other hand, are flakes that have been steamed, rolled, steamed again, and toasted. During that process some nutrients, texture, and even flavor are lost. 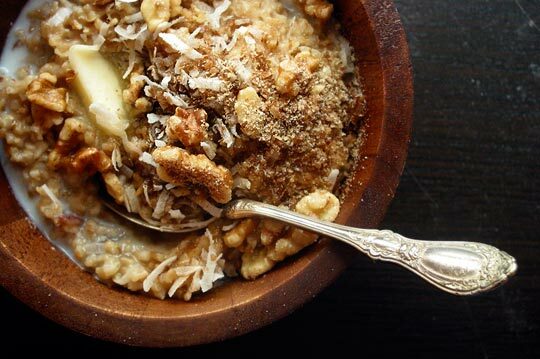 Steel cut oats have a nuttier, more hearty flavor than rolled oats. Steel cut oats contain seven B vitamins, are high in calcium and iron, and are full of protein and fiber while low in salt and unsaturated fat. The most significant benefit of oats comes from the soluable fiber, which lowers cholesterol levels and consequently reduces the risk of heart disease and diabetes, among other things. A common complaint about steel cut oats is the time it takes to prepare them in the morning. Most runners want a breakfast you can grab and go. So, here is a favorite recipe for oatmeal that you can prepare the night before. On race morning or before a training run, just pop a bowl in the microwave. Boil the water. Add salt and oatmeal, stir well. Turn OFF the heat, and continue to stir until boiling stops. Cover, and let sit overnight. In the morning, you can divide the oatmeal into 4 individual serving dishes, and refrigerate, so breakfast is ready for the next four days. Microwave for 2 minutes. Top with strawberries, raspberries, chopped nuts, maple syrup, cinnamon, and/or honey.